Update, 8:42 p.m. on 11/16/15: The Burlington City Council unanimously approved the spending request. The price tag to remove the contaminated dirt stockpiled in Burlington's Leddy Arena parking lot has been tallied up, and it's not cheap: $339,000. Burlington Parks and Recreation director Jesse Bridges will ask the city council tonight to authorize that amount be paid from the $800,000 tax increment financing allotment that voters approved last year for waterfront park improvements. The mini-mountain of soil at Leddy will likely be hauled away to a landfill in Vermont or New York and used as "daily cover" — the dirt that is applied over each day's deposit of trash. Bridges is working with Chittenden Solid Waste Disposal to get tipping fees waived or reduced, which could reduce the disposal price tag. But if environmental regulators say the dirt can't be used as "daily cover" and it has to be disposed as solid waste, the removal costs could go up, Bridges warned in a memo to the city council. 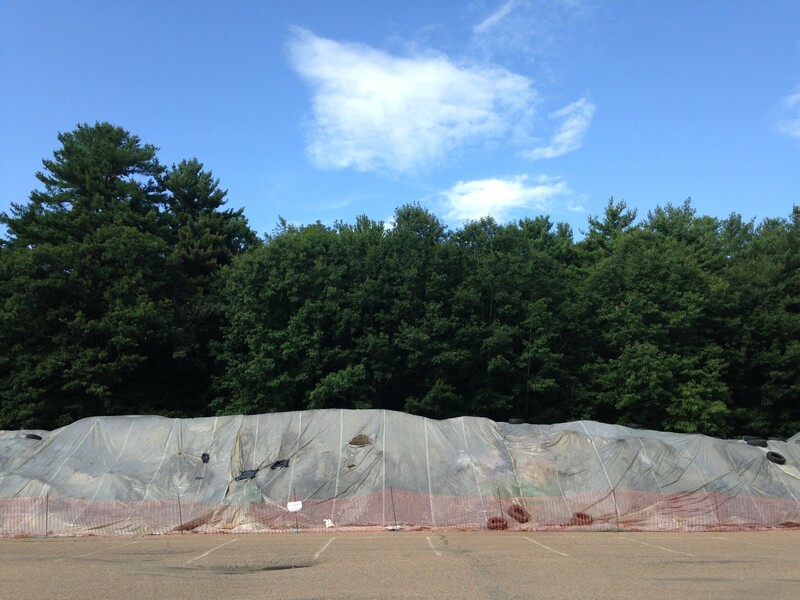 Trash company ENPRO beat out Casella in a bid to remove the 2,500-cubic-yard pile, now covered in tarps. The soil was excavated during the first phase of reconstruction of the nearby Burlington Bike Path on the waterfront. City officials hauled the soil to Leddy for temporary storage and testing after the odor and appearance of the dirt suggested contamination, possibly from one of the many former industrial uses on the waterfront. The dirt has been stockpiled in Leddy for nearly a year, with unhappy neighbors in the New North End pushing the city to get rid of it. Soil tests confirmed the presence of PCBs at low amounts earlier this month. The now-banned chemicals were once widely used in electrical equipment, hydraulic fluids and various lubricants. When is the pile going to disappear from Leddy? There's no date yet, but the city should have one for the public by December 15 as promised, according to Bridges.